Sony showed off the latest addition to its line of Walkman digital music players Wednesday, the NW-HD5. While it is the fifth hard drive player to be released by the company, it will be the first to see worldwide distribution. One major difference, however, is in the design. 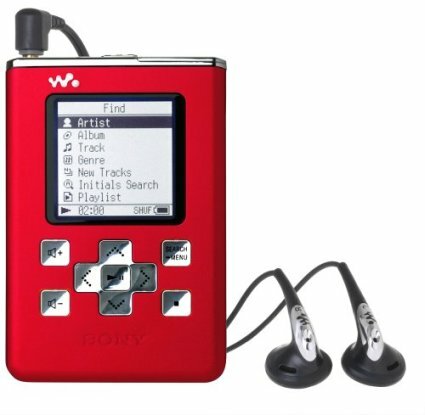 Unlike Sony's previous units, the NW-HD5 is designed to stand upright, similar to Apple's iPod. Users will have the option to use the player on its side if they wish. Also, the circular controls on Sony's previous players have now been replaced with nine buttons, which appear similar to gaming controls. The NW-HD5 supports MP3 and Sony's proprietary ATRAC3 formats, as well as Windows Media and WAV files. The capacity, as with previous models, will remain at 20GB, enough to hold 10,000 songs. Battery life improvement was also a focus with the latest redesign of the player, and Sony claims 30 hours of continuous playback when listening to 128kpbs MP3 files. This is an improvement of 8 hours over the previous iteration. It is unclear whether Sony intends to market the NW-HD5 as an "iPod killer," but if so, it may be a hard sell to consumers. A recent survey of teens found that while Sony is second to iPod in terms of the players teens plan to buy, it's by a wide margin. 70 percent of teens plan to buy an iPod, while only 15 percent plan to buy a Sony player. The NW-HD5 player will first be released in Japan later this month at a street price of $327 USD. Sony said that it will announce plans for a worldwide release in the coming weeks.